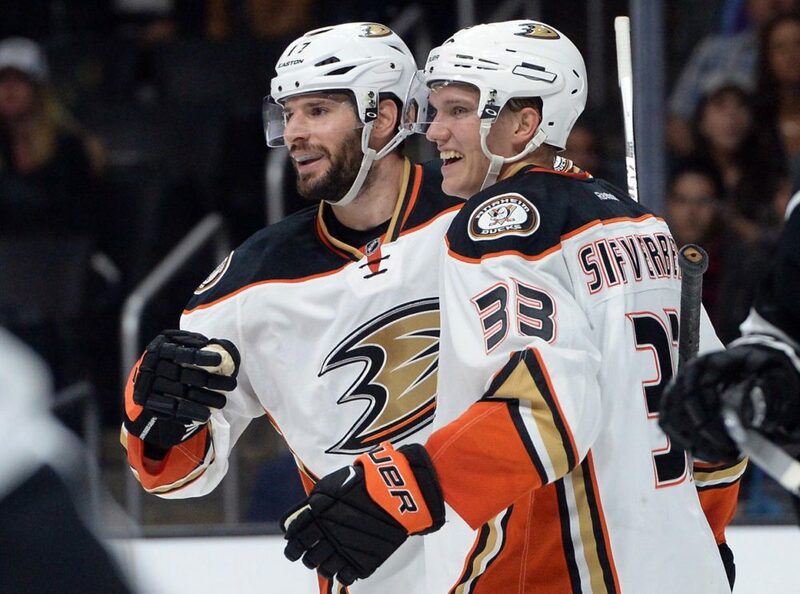 ANAHEIM – In earning two more more points Wednesday night, the Anaheim Ducks clearly displayed why they sit atop of the NHL world. Gaining a 2-1 victory over the Edmonton Oilers before 16,371 in the Honda Center, the win was the Ducks’ 12th straight, one-goal victory. Good teams usually find ways to win but teams which stay ahead the pack also demonstrate versatility. Better teams dominate in stretches in which the Ducks find themselves but their winning ways could stand improvement. Through their run, the Ducks have lost key personnel to injury but others have stepped forward. Case in point is forward Matt Beleskey. Scoring the first Anaheim goal on converting a pass into the slot from Kyle Palmieri on the power play, Beleskey picked up his second tally in the last three games. In the absence of Corey Perry, out for about a month with a knee injury and the Ducks leading scorer, Beleskey explained why he may be in the right place at the right time. If the Ducks continue to lead the league in standing points and begin to create separation from other Pacific Division and Western Conference teams, they will likely display the kind of execution demonstrated against the Oilers. This is a team which has great puck control and players who make, quick, smart decisions. Plus, intangibles are creeping into the Ducks’ style. Kesler, with five points in his last three games, is another to elevate his game. For the winning goal, he converted a pass from Hampus Lindstrom into his 10th of the season and his fourth in his last three games. The veteran Kesler represents the criteria of “good players” which Boudreau cites as critical in winning. Asked about why his team continues to lead the NHL, Boudreau did not have to think for very long.